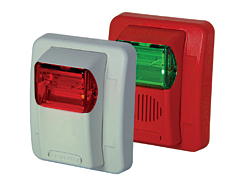 The Emergency Communication System Commander 3 Series products are wall-mount, low-profile strobe or horn/strobe combinations that offer audible and visual alarms for warning and emergency notification. Field selectable candela options of 15, 30, 60, 75, and 110 candela. Available in 24 volt. Lens available in amber, blue, green and red.